Atom interferometers rely on a counterintuitive but central precept of quantum mechanics: Everything, including matter – not just subatomic particles, atoms and molecules, but also macroscopic objects such as Buicks and buildings – has wave properties. Just like waves of light or sound, “matter waves” from different objects can interfere with one another constructively (reinforcement) or destructively (cancellation). In addition, the new design takes advantage of yet another quantum phenomenon: “superposition,” a condition in which objects have multiple values of the same property at the same time – the equivalent, in the classical world, of a ball that is simultaneously completely red and completely blue until someone looks at it. Once it is seen (or measured in any other way), however, the superposition disappears and the ball becomes either red or blue. Then each atom is exposed to microwave radiation tuned to the specific wavelength that will project it into a “superposition” of two opposite spin states. [See Step 1 in the attached figure.] At that point, the trap is displaced by a small amount, about 20 micrometers, which has the effect of moving the atom, with its superposed states, into a different part of the synthetic field. [Step 2 in the figure.] Each of the two spin states starts to move in a spiral motion, but in opposite directions around the interior of the trap. [Step 3 in the illustration, also depicted in the short movie.] While in transit, each superposition state will be affected differently by gravity or any other acceleration. As a result, when their paths once again overlap at the end of their spiral trajectories, they will be slightly out of phase. 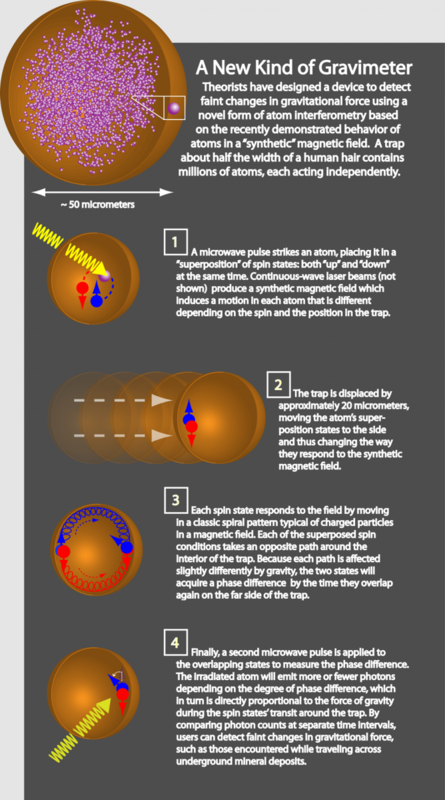 Finally, the atom is irradiated with a second microwave pulse [Step 4] that causes the atom to emit light if it is in a certain spin state, and to remain “dark” (no emission) if it is in another. If the superposed spin states had not experienced any external effects, such as gravity, each atom in the trap would have a 50-percent chance of emitting or not emitting. But if the paths of the spin states are affected by gravity, the collective output of the entire set of trapped atoms will emit more or less light – and the degree to which the light output varies is a measure of the strength of the gravitational field. In addition to its potential practical uses, the new design can help test the fundamental laws of nature, such as Einstein’s theory of relativity, which some believe maybreak down at very small time and length scales.